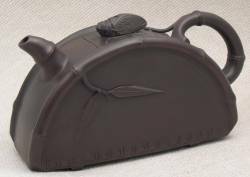 This deep, rich brown arch shaped Yixing teapot has detailed bamboo trim on both sides of the body of the teapot. The handle is also shaped like a bamboo shoot attached to the teapot by a root. The spout is also a bamboo shoot. A beetle graces the top of the square lid on top of the teapot. The Arched Bamboo teapot holds a generous 15 ounces of tea. The unique shape of this Chinese clay teapot makes it a great collectors item.